Daniel Casares , was born with «duende» and so is demonstrated by his guitar, which sounds original, distinct, with a personality of its own, reflecting that inner fury, which unleashes powerfully on its strings. Daniel Casares was born in 1980, in «El Limonar» neighborhood, Málaga (Spain). His professional career is premature; with only 13 years old he participated in the recording of the collective album "A la Guitarra de Estepona" (To Estepona’s Guitar). At the age of 16, he is awarded with the prestigious Bordón minero de La Unión, becoming the youngest guitarist, up to date, to achieve it. In addition, he rises with the Guitar Award of Jaén and this allows him to record his first album "Duende Flamenco" that same year, although it would not be published until 1999, when he was already 19 years old. His endearing musicality is intimately linked to Maestro Juanito Valderrama, whom he accompanied during his last years; this union is captured in the album "Don Juan" recorded live at the Festival Flamenco de la Unión (Murcia). Also the lyric music universe has been able to enjoy Daniel Casares, since the mezzo-soprano Cecilia Bartoli, asked him to accompany her -as a guest artist- on her European tour on the occasion of the presentation and tribute to the diva María Malibrán In terms of awards and recognitions, Daniel Casares was named in New York 2005, "Musical Revelation", granted by the association of ACE show chroniclers. In 2010 he was chosen by the international delegation, to represent European culture, at the presentation gala to the media in the Shanghai Expo 2010. There are countless collaborations of Daniel Casares with other artists such as Alejandro Sanz, Miguel Poveda, Dulce Pontes, Pasión Vega, Toquinho, Antonio Orozco, José Mercé, etc ... As a result of these collaborations, Alejandro Sanz became editor of his 5th album "El ladrón de agua". He collaborates live and also sets into music some of the lyrics and works for Dulce Pontes and Miguel Poveda. On July 2014 he premiered "La luna de Alejandra" together with the Philharmonic Orchestra of Málaga, his first symphonic work for guitar and orchestra. Orchestrated and directed by maestro José Miguel Évora. In 2015 he added the "Concierto de Aranjuez" by Joaquín Rodrigo to his symphonic repertoire, presenting it in the same concert along with "La luna de Alejandra". On November 13th, 2015, he performed this concert at the Church of Our Lady of Candelaria in Rio de Janeiro, as a commemoration of the 75th anniversary of the work of Joaquín Rodrigo. His first symphonic work 'La Luna de Alejandra' (Alejandra’s Moon) comes to Daniel in a very sweet moment, the birth of his first daughter to whom Daniel delivers his moon. According to his own words, the birth of his daughter grabbed him, even more, to his guitar. And his compositions took on a much more melodic sense, as the first movement, which gives its name to the work, and which was created at the foot of his daughter's crib. In addition, Daniel wanted to rescue some pieces of previous works, and that he already composed with an open mind to the possibility of being able to orchestrate them someday. 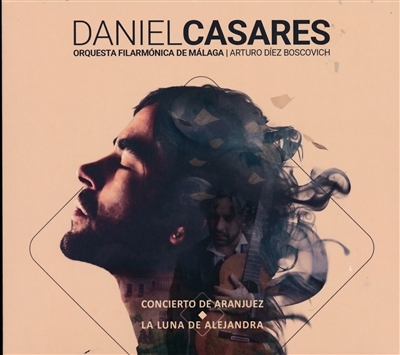 The orchestration is been carried out by the maestro José Miguel Évora, which was the first option in which Daniel thought when the manager of the Málaga Philharmonic Orchestra, Juan Carlos Ramírez, proposed him the project. In their first meeting Daniel shared some part of the composition and Évora agreed to take part of the project which he already believed it was meant to be a great journey. Alejandra's moon is a flamenco work that approaches to -in its sound concept and orchestration- works such as 'El amor brujo de Falla', 'El concierto de Aranjuez', or some works by Ravel.